Congratulations to Our New Board Members! 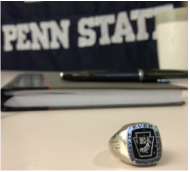 Thank you Lion's Paw Class of 2013, for a wonderful year of humble service to Penn State. We welcome you to the Lion's Paw Alumni Association and look forward to you serving Lion's Paw and Penn State in the future! The Board looks forward to your service to the LPAA, and cannot wait to have a productive year together.